Happy Tuesday my friends. We are in the midst of a string of sunny days and I can't tell you how wonderful it is to finally see the sun! They are also calling for near 50૦F Wednesday, Thursday and Friday which is going to feel like a heat wave compared to what we have had, so I'm looking forward to that. In the meantime, I did get some time in the craft room this week and played around with some fun new product. I am totally in love with this new Cupcakes and Carousels DSP pack. It's 6" x 6" paper and the colors are just gorgeous.The paper has a vintage feel to them while being fun at the same time. The card base is Early Espresso cut 8 1/2" x 5 1/2" and the DSP is 4 1/8" x 5 3/8". I cut the Early Espresso strip 1 1/2" x 3 3/4" and the Calypso Coral Strip is 1 1/2" x 3". 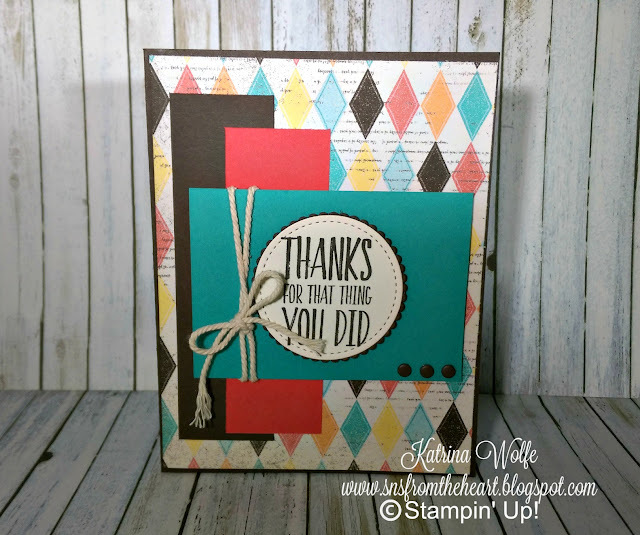 I stamped the sentiment in Early Espresso ink onto Very Vanilla cardstock and cut it out with a Stitched Shapes circle framelit and layered it onto a piece of Early Espresso cut with a scalloped circle from the Layered Circles framelits collection. I layered that onto a piece of Bermuda Bay cardstock cut 2 1/2" x 3 1/4". I wrapped a piece of Thick Very Vanilla Bakers Twine and tied it into a bow and adhered it to the card with Stampin' Dimensionals. The candy dots added to the bottom of the Bermuda Bay are retired candy dots I had in my stash that I pulled out. I hope you enjoyed today's card. Please leave me a message and let me know your thoughts. Thanks so much for stopping by and having a look around. I wish you all a wonderful day and happy stamping!